Some doctors use the figure 8 suture as the suturing method of choice when suturing skin wounds/lacerations. The figure 8 suture is most commonly used by health professionals when faced with one of three different scenarios. Patients are hypersensitive or allergic to commonly used resorbable suture materials. Resorbable materials are absorbed over time by the body and do not need to be removed by a medical practitioner. Dehiscence of a previously sutured wound occurs. Dehiscence is when a wound opens again after the sutures are removed. You are closing a skin wound where uneven margins or a dog’s ear defect is anticipated. E.g. a round/elliptical defect. Use the needle with suture material attached, clipped to the needle holder. Use the imitation or practice skin with a ±7 cm (2,5 inch) cut representing a surgical incision or a laceration in the skin. You’ll start the suture in the region of one of the positional markings on the laceration on the imitation skin, on the far side. Evert the far side of the laceration with the tissue forceps and insert the needle between five and ten millimeters (about a quarter inch) away from the wound edge. Take a bite in the depth of the subcutaneous tissue on the near side, twisting the needle to let the needle-tip emerge just below the dermis. 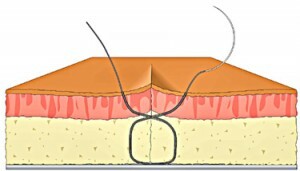 Place the last section of the suture by penetrating the tissue on the near side just below the dermis, with the needle facing upwards. Allow the needle tip to emerge about three millimeters away from the edge of the wound on the near side. Tie an instrument square knot or a surgeons knot. Cut both ends of the suture leaving at least three millimeters of suture material beyond the knot. Place a second figure-8 suture about three millimeters to the right of the first suture by repeating Steps 4 and 5. Follow up with more figure-8 sutures until the laceration is closed. When all is said and done this is the path of the suture. In top left, then bottom right, then bottom left, then out top right. It is removable. 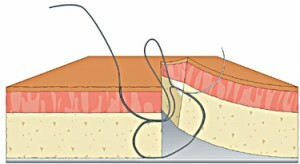 Traditional subcutaneous sutures cannot be removed and must be resorbable. In other words, it must be made of material that can be absorbed by the body’s tissue enzymes. It allows closure of two layers simultaneously. Compared with the interrupted stitch, ischemia at the edge of the suture is reduced. Ischemia is a reduction in the blood supply to the body tissue. Being removable, one avoids burying foreign material in the depth of the tissue, minimizing the chances of developing a stitch abscess or related complications. 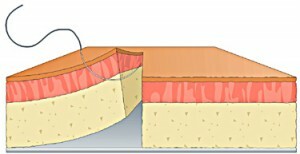 This technique enables any length difference between the flaps to be evened up when sutured. It minimizes “dog’s ear” defects. 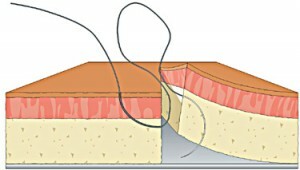 The figure-8 suturing technique is more difficult to master and perform properly compared to interrupted sutures. Patients experience slightly more discomfort on stitch removal compared to the interrupted sutures. I’ve been busy recently converting The Apprentice Doctor “How to Stitch-Up Wounds” Course into a hard-copy book which will be promoted by a really huge publishing company, which I can’t name right now. “In any practical endeavor, from writing a book, to painting a picture, to performing a surgical operation, knowledge of the subject, no matter how profound, can never by itself lead to a satisfactory outcome. A sound grounding in the basic skills of the discipline is an essential prerequisite. Technical skill is the handmaiden of all knowledge applied to practical ends. 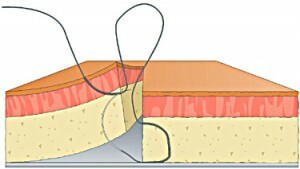 In the field of practical surgery, suturing technique is the most basic skill, yet all too often, even for those at an advanced level of surgical training, special courses in surgical techniques are sometimes found to be necessary to make up for deficiencies in earlier training. Dr Anton Scheepers, a practicing maxillofacial and oral surgeon of many years experience, has reduced the topic of surgical suturing in all its variety to basic step-by-step technique, with comments on wound care, and has presented this in a form that will be both educational and skill-promotive. This manual can serve as an appetite-whetter for high school students interested in careers in any clinical field, as a revision for medical, dental, veterinary and paramedical practitioners, and – dare one say? 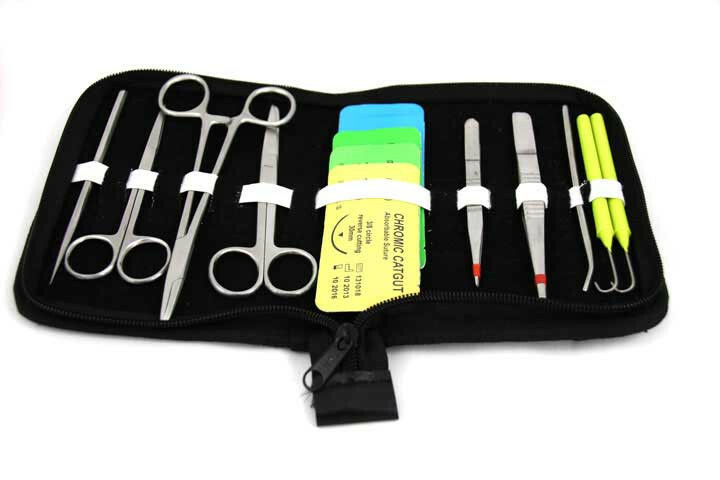 – it might even be useful in junior specialist surgical training. Professor Emeritus of Oral Medicine and Periodontology, University of the Witwatersrand, Johannesburg. Honorary Professor of Periodontology and Oral Medicine. Honorary Fellow of the Colleges of Medicine. We would love to answer any questions you have about the figure-8 suture technique so leave a comment or question below. Cut under the knot just above the skin one the one side (not both!) then take forceps securely and pull out all the way (not too slow neither too fast) – will need a bit more effort compared to interrupted suture for instance… trust it helps!